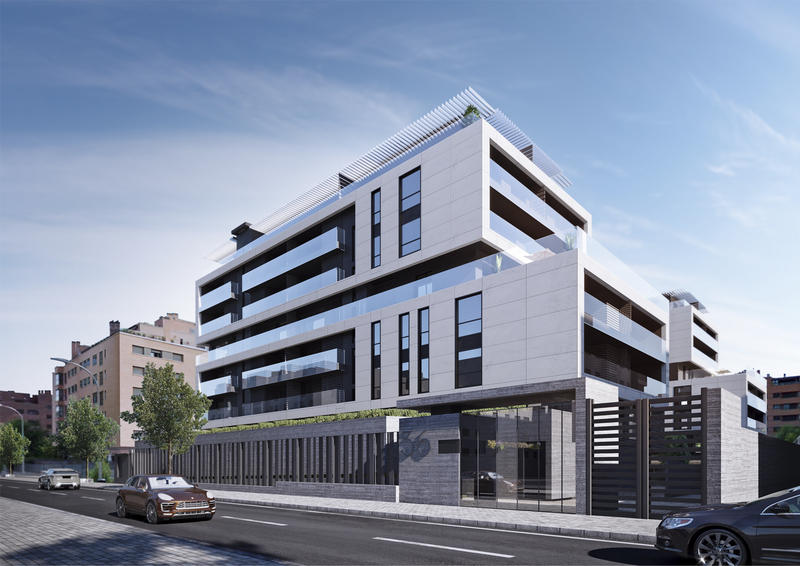 Located in one of the fastest growing areas of Madrid in the last decade, and with a continuously growing population density, these apartments designed for Ebrosa are all about finding the perfect fit. The project, titled CUBIK, tries to define a residential ensemble that responds to its surroundings while enhancing the plot’s characteristics. The project’s location is one of its best values; up-close just as much as its territorial location in the north of Madrid. The U-shaped layout of the building has been designed to open the closed inner courtyard, thus allowing natural light into the apartments, the garden, and the swimming pool. The building, which will house 79 apartments from 2 to 4 bedrooms and 141 garage spaces, has made its common areas one of its hallmarks: a paddle court, two swimming pools, a landscaped solarium, and a playground. The apartments have been designed within two opposing façades that favor interior ventilation, and that simultaneously provide an optimal orientation. Also, the stepped volume towards the south allows for wide terraces that are partially covered by pergolas.